Which gets us to the point of this post. A week or so ago I was invited to join the Design Team over at Poisoned Peas Please, an alternative art group. 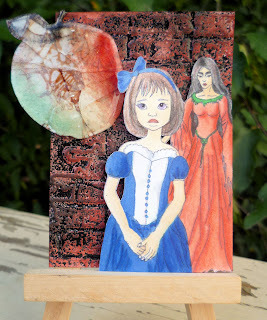 I decided to get my odd on and join up and my first project is for the "Dark Fairy Tales" challenge. 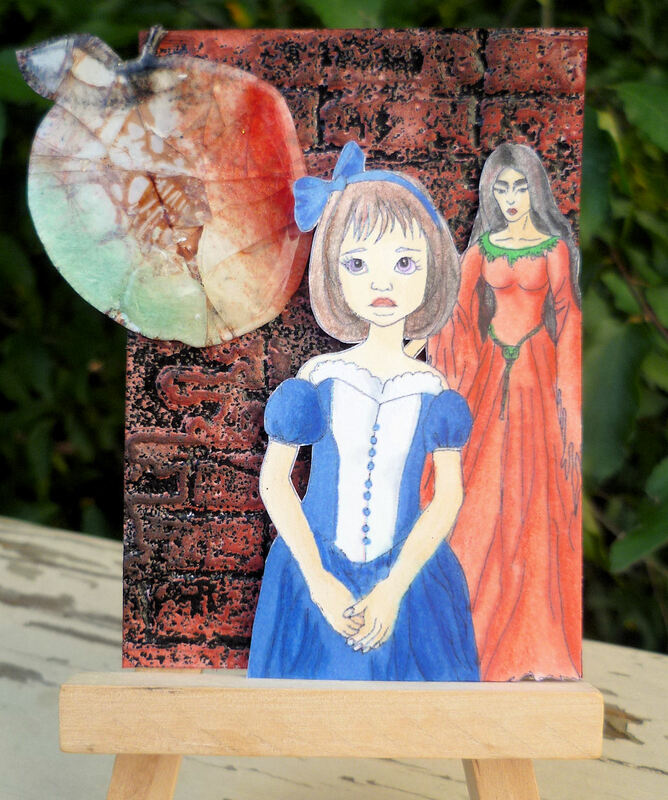 I went, as you may imagine, with a Snow White and the wicked stepmother theme. I added in a rotten apple for good luck. That turned out a bit more rotten than I intended- I used the crackle method with embossing powder and it crackled so much chunks started to fall out. Oops. Oh well- it just adds to the nastiness of the apple. It's a feature. People pay extra for those. LOL! Hope you decide to join us over at PPP- it's definitely a chance to do something a bit different than flower, butterflies, birds, gears and such. Great project! Congrats on your new DT position! Love the brick background here. Thank you for sharing with us at Simon Says Stamp and Show! Love the brick background and crackled apple. Your images are showcased wonderfully by both. Congrats on your new DT position. Thanks for joining our Power of 3 challenge at Craft Your Passion. I hope you come back soon.